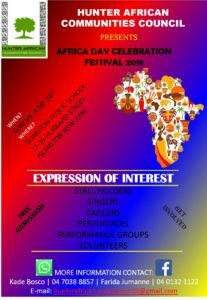 Join us for a vibrant, dynamic and colourful Africa Day Celebration Festival as we celebrate African Heritage, Unity and Diversity. 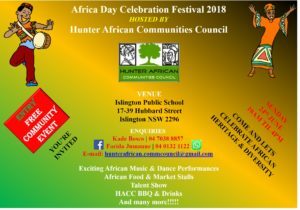 It is common good to integrate, rekindle & revitalise our commitment to building positive relations that support multi-culturalism in The Hunter Region. For further inquiries or if you’d like to showcase your talent, performances and volunteering on the day, express your interest by giving us a call or send a message or e-mail and one of our organizers will be in contact.